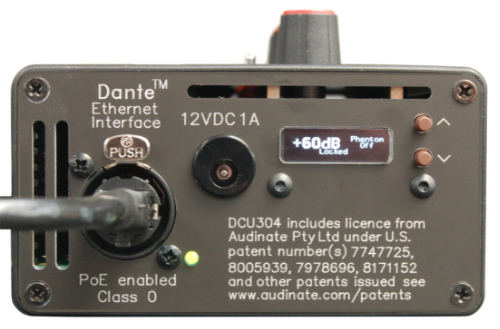 We are licensed manufacturers of Dante enabled network audio equipment. Please watch this page for more Dante enabled products coming soon. As you can see from the logo, all products are Dante Domain Manager compatible. The DPM802 is a Dante enabled PoE Production monitor unit with eight Dante stereo inputs, one analogue stereo input and both Dante and analogue stereo outputs. The unit includes up to eight frames of programmable stereo delay plus cut, dim and of course a volume control. There are also two GPI inputs for remote control of cut and dim. The DPM802 has many features that may be programmed via its web page including key colours, delay time, input gains and remote control of functions. For convenience of adjustment the delay time may also be set using just the front panel controls as well as via the web page. The unit includes a redundant network connection which may alternatively be used as a network switch output. The Dante Outputs Left and Right are mirrored on the rear of the DPM802 as balanced XLR analogue outputs for convenient connection to a power amplifier. The two analogue inputs may be assigned to any of the select switches. The unit may be powered by mains or PoE or both. The DCD2020 is a Dante enabled Commentary box supporting 2+1 commentators. Network connection may be fibre or copper and it has full network redundancy. Microphone amplifier gains and many other adjustments such as phantom power and limit levels may be made on the local lockable LCD screen or remotely via the DCD2020's web page. In addition to the commentary box functions there is a built in Dante breakout box with six analogue inputs and eight analogue outputs. With 240V mains, 12 volt and PoE powering and a built in ethernet switch the DCD2020 can truly be the hub of your commentary system. The DCD2020 includes three digitally controlled microphone amplifiers with very low distortion and really natural sounding audio amplification. Microphone amplifier gain is adjustable in 1dB steps from 0dB to +70dB. Each microphone has its own adjustable threshold limiter and switchable 48 volt phantom power with status indicated by red LEDs on the front of the unit. There is also a mixed output available with its own limiter. Commentators A and B have four individually selectable talk keys each and the guest position has two. Each also has an On-Air key which may serve as an indicator, a 'cough' key or a latching On/Off Air key. There are eight individual listen inputs for Commentator A and B and four for the guest, all with left/right/both ear piece select switches. 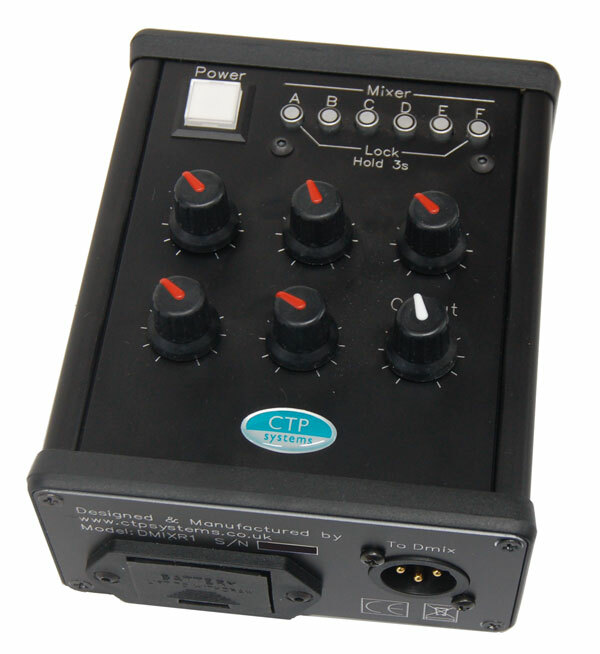 Each commentary position may be connected using 5 pin headset XLRs or XLR 3 mic input and TRS jacks, suitable for use with both 1/4 inch or PO. The DCD2020 can be powered by 110-240VAC mains, PoE, 12 volts or any combination for a redundant power supply. The unit includes three GPI inputs for remote talk key switching and three GPI outputs for on-air light switching on the rear D15 connector. There are six analogue inputs and eight analogue outputs available via XLR on the rear of the unit, all accessible via the network. These breakouts have no fixed function and may be used for external facilities as required. They may also be used to provide analogue inputs and outputs to/from the commentary box. system includes two 2:1 Dante mixers for convenient adding of Dante audio signals. Our purpose was to design a unit to match all current technological requirements whilst still retaining a familiar feel for the commentator. with four inputs, each selectable to left/right/both ears, one microphone output plus a cough key and two 'lazy' talkback outputs. On pressing a talkback key the programme microphone output is silently muted and redirected to the selected talkback output(s). The microphone also has a local line level analogue output which also mutes when a talkback key is pressed. Network connection may be either a Neutrik ethercon or a standard RJ45 connector. A LED indicates network status. Microphone gain is adjustable in 1dB steps from +70dB to +15dB and +6dB via the OLED display and lockable push buttons. 48 volt phantom power may also be selected. The DCU304 may be powered PoE or via an external 12 volt power source. 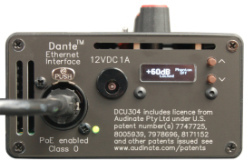 The DCU304 can also be used as a cost effective Dante four wire box or as a top quality analogue or Dante mic amp. 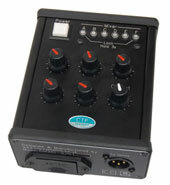 The FWD8000 is a Dante enabled four wire box with eight four wire inputs, eight four wire outputs plus eight IFB inputs. A mix output and a hot microphone output are also available on the network. 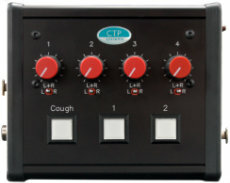 In addition to the network connections four of the four wire inputs and outputs are mirrored onto the rear of the unit for local analogue use as well as two IFB inputs. Power may be supplied by PoE, an external 12 volt supply or battery or via the IEC mains inlet. Each channel has a cut switch, a ifb monitor button plus a vox incoming audio present indicator. Press the talk keys down for momentary operation and up to latch. The latch operation can be defeated if required. 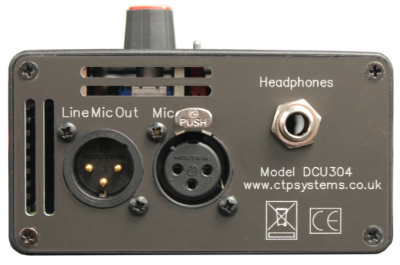 Units can be supplied with a headphone jack or a 5 pin XLR headset connector. There is an 'all talk' key which can be set to talk to any or all of the four wire outputs. There is also a microphone cut button. When a talk key is pressed incoming audio to the loudspeaker is normally dimmed to prevent feedback, the level may be adjusted or defeated as required. The FWD8000 has a secondary ethernet interface which may be used a switch output or for network redundancy. Mains requirement is 110-240VAC 50/60Hz. The FWD6006 is a six channel desktop version of the FWD8000 above. 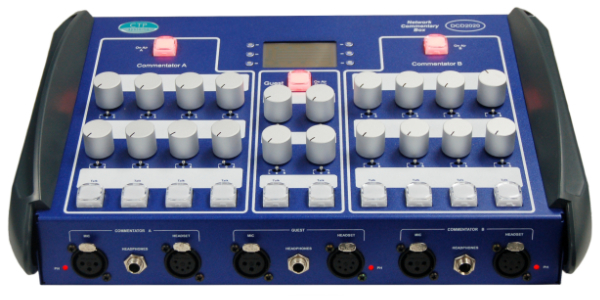 It is a Dante enabled four wire box with six four wire inputs, six four wire outputs plus six IFB inputs. A mix output and a hot microphone output are also available on the network. 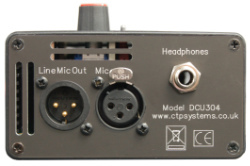 In addition to the network connections three of the four wire inputs and outputs are mirrored onto the rear of the unit for local analogue use as well as two IFB inputs. There is also a microphone cut button. When a talk key is pressed incoming audio to the loudspeaker is normally dimmed to prevent feedback, the level may be adjusted or defeated as required. The FWD6006 has a secondary ethernet interface which may be used a switch output or for network redundancy. Dimensions: 100mm high, 180mm deep, 200mm wide. The DMIX30 is a Dante enabled mixer which includes six discrete five into one mixers. All audio inputs and outputs are assignable via the Dante network and have adjustable gain from off to +12dB. Additional gain of +20dB may be switched to each input allowing a maximum of +44dB gain. 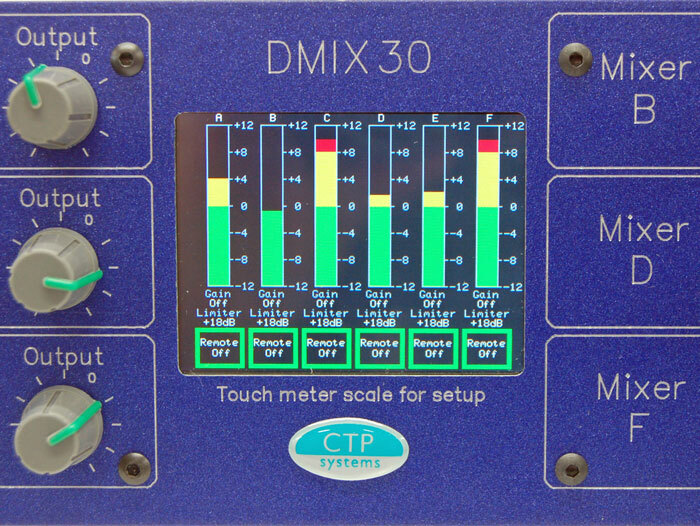 All mixers include a switchable limiter with threshold adjustment. All six mixers have TFT bargraph metering which may be selected to either dBFS or PPM metering scales with appropriate ballistics. The six mixer outputs are available over the Dante network but also as balanced analogue XLR outputs on the rear of the unit. The secondary Dante network connector can be selected to operate either in redundant mode or as a switch output to daisy chain to more Dante equipped devices. 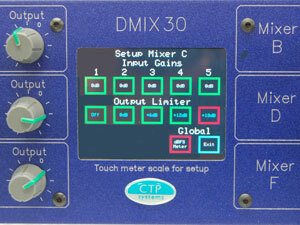 A special feature of this unit is that any or all of the mixers may be remote controlled. 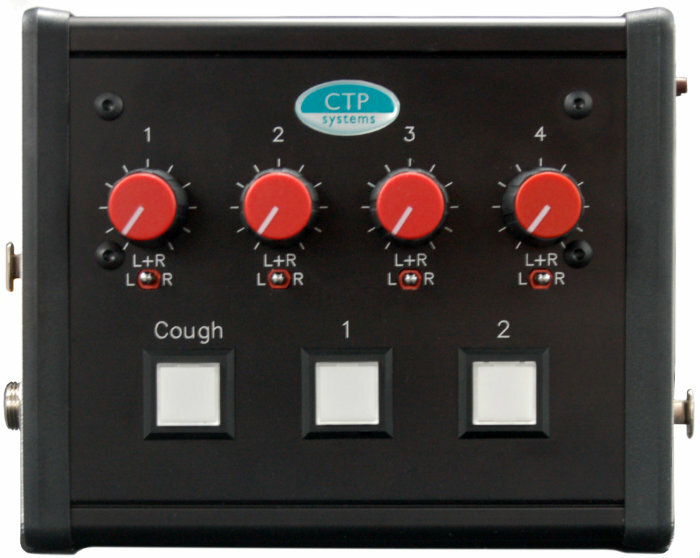 The unit can accept up to six separate remotes each of which is assignable to any of or any combination of the mixers. Perfect for controlling remote sources such as radio talkback feeds. The data from the remotes is encoded in a modified 'time code' signal so may be carried over any standard audio transport, including audio fibre channels. The remotes are available separately so may be added if and when required. The unit operates on 110-240VAC 50/60Hz with auto switching. The Prehear D4080 is a Dante enabled version of our analogue Prehear 1020. The unit is unusual in that it is Dante equipped but is also fully functional in stand alone analogue mode or even both at once, particularly useful for derigs. The unit presents itself to the network as a ten input, two output device but also has ten analogue inputs and two analogue outputs. All inputs are selectable to either or both of the two internal speakers, line level speaker outputs and headphone socket with individual volume controls, cut buttons and signal input LEDs. The unit includes a secondary port for Dante Redundancy or a switch output. Both ports include network activity LEDs. The Prehear 4080 covers all those 'listen' feeds required by production. Pre-fade listen feeds of presenters, off air feeds, and all those other bits and pieces that waste talkback matrix inputs can be fed directly to these units with convenient local control. Each input may be switched to left, right, or both speakers. Each channel has an audio present (VOX) indicator, a volume control and a cut switch with bright blue illumination. There is a speaker cut button with red illumination and a stereo headphone socket suitable for stereo or 316 jacks. An indicator illuminates on successful connection to the network. Both loudspeaker amplifiers have built in limiters to protect the loudspeakers. All analogue inputs and outputs are on XLR and there are two line level outputs with switching following the left/right/both switches. The unit will operate on 110-240VAC with auto switching. The DIO88 is an inexpensive way to get your analogue signals into and out of the Dante network. The unit has eight XLR inputs and eight XLR outputs. The secondary Dante network connector can be selected to operate either in redundant mode or as a switch output to daisy chain more Dante equipped devices. The DIO88 includes a power indicator and network connection indication on the RJ45 jacks.